The image to the right illustrates the start position of a hexalex puzzle: a hexagonal grid that contains some start letters, together with a list of letters underneath it and a list of words to the right of the grid. 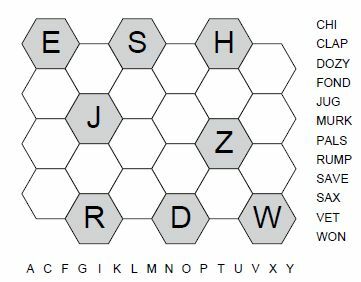 The aim is simple, but can be deceptively tricky to complete: place the letters under the grid once each into the empty hexagons, in such a way as to both complete the grid and make it possible to find each of the words in the grid by moving from hexagon to adjacent hexagon. For instance, the 'C' must neighbour the 'H' hexagon and so must the 'I', in order that it be possible to make the first word on the list 'CHI'. There are a range of logical rules that can be used to help you solve hexalex; some puzzles will require harder logic than others to complete successfully. The best place to start is to look at the letters in the corner hexagons, as these have fewer neighbours, and looking at the list of words to see which letters must be adjacent to these starting letters. For instance, the letter 'E' is in the top-left hexagon here, and we can see the word VET is to be found in the grid. We therefore know that the two hexagons that neighbour the 'E' must contain the V and the T in some order. Now looking at the word 'SAVE' we see that the 'V' must be shared by the 'E' and the 'S', as if the 'T' instead were shared between the 'E' and 'S', it would be impossible to place both 'SAVE' and 'VET' in the grid at the same time. Hexalex puzzles make a great and novel addition to any puzzle page, with their distinctive and attractive hexagonal grids adding appeal, together with an enjoyable solve combining several logical rules. If you are interested in purchasing Hexalex puzzles, then please do Contact Us with your requirements.